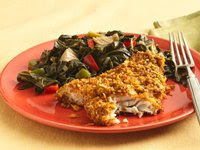 From Betty's Soul Food Collection... Everyone goes nuts for our Pecan-Crusted Catfish, baked instead of fried and an outstanding recipe for anyone watching their cholesterol. Heat oven to 450 degrees F. Spray 15x10-inch pan with sides with cooking spray. In large resealable plastic food-storage bag, place cornflake crumbs, pecans, salt, paprika, garlic powder and red pepper; shake to mix well. In shallow dish, beat egg whites slightly with fork. Dip fish into egg whites; place in bag. Seal bag and shake until fish is evenly coated. Place in pan. Bake 15 to 20 minutes or until fish flakes easily with fork. Calories 230 (Calories from Fat 110); Total Fat 12g (Saturated Fat 2g, Trans Fat 0g); Cholesterol 85mg; Sodium 310mg; Total Carbohydrate 5g (Dietary Fiber 0g, Sugars 0g); Protein 25g. Daily Values: Vitamin A 6%; Vitamin C 2%; Calcium 6%; Iron 20%. Exchanges: 0 Starch; 1/2 Other Carbohydrate; 0 Vegetable; 3 1/2 Lean Meat. Carbohydrate Choices: 1/2. This entry was posted on 3:23 PM and is filed under Fish and Seafood . You can follow any responses to this entry through the RSS 2.0 feed. You can leave a response, or trackback from your own site.